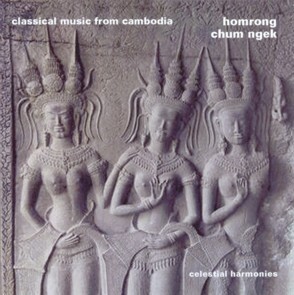 Homrong by CHUM Ngek captures a rare performance of the twelve sacred songs that are pivotal to the Khmer classical music tradition known as pin peat. Prior to this release, the renditions contained on this CD have existed nowhere else in the world, except, literally, in CHUM Ngeks mind and body. The term, Homrong, refers to the entire series of pieces preserved on this recording. The sequence contains a complex body of Khmer artistic and cultural knowledge in condensed form. Homrong was many years in the making. The artist conceived the project in the mid-1990s when he realized that his life as an immigrant to the United States had simultaneously saved and put at risk his abundant musical knowledge. That he made it to the U.S. at all after nearly four years of life in Cambodia under the genocidal Khmer Rouge offered promise for the future of the three genres (pin peat, mohori, and phleng kar) he had mastered by the age of eighteen. CHUM was among the few fortunate and highly talented musicians to have escaped execution during the 1970s. When the producer, Joanna Pecore (who became CHUMs student in 1996), heard about this, she endeavored to help CHUM to realize his hopes. Between 1999 and 2000, she contacted several record labels with the idea, but to no avail. However, she persisted, and in 2000, Celestial Harmonies immediately recognized the value of the proposal. When the company heard CHUMs demo in 2001, it requested a full-length version for release. CHUM and Pecore were finally able to fulfill the request when the Cambodian American Heritage, Inc. received a grant from the Virginia Foundation for the Humanities and Public Policy in 2002 to record CHUM as he performed the twelve pieces of Homrong on eight instruments of the pin peat ensemble. CHUM Ngek is one of the few living Khmer music masters worldwide who possesses a vast repertoire and command of multiple instruments across various genres. Born in Battambang Province, Cambodia, he arrived in the U.S. in 1982. Since his arrival, he has been advising, teaching and performing across the country. He has been a valuable source for research and educational materials that document Khmer music, including projects that have helped to revive traditional music in Cambodia. He performs regularly at venues such as the Kennedy Center, Smithsonian Institution, and National Folk Festival; provides music for Khmer traditional weddings and religious ceremonies; and performs for and teaches weekly at the Cambodian American Heritage, Inc. in Virginia and Cambodian Buddhist Society Inc. in Maryland. CHUMs role in these organisations and others across the country extends far beyond mere performance: As the bearer of an endangered tradition, he is the consultant for them, providing guidance about appropriate repertoire and style for each event. This recordings producer, Joanna Pecore, is an ethnomusicologist, educator, and musician who was educated in the USA, Japan, and Austria. A member of ICTM (International Council for Traditional Music), she has been associated with a large number of institutions and events, among them the Smithsonian Institution, the Asia Society (New York City), the embassies of Japan and South Korea to the United States, and the Metropolitan Museum of Art (New York City). She has bought CHUM Ngek to the attention of Celestial Harmonies, and we are pleased to welcome her with this first project, looking forward to many more. CHUM and Joanna are delighted that Celestial Harmonies has issued this majestic and long-overdue recording of Khmer classical music. 4 Bathom, Lea, Smoeu, Rua 9'05"
9 Krao Nai, Lea 14'27"
10 Yav, Rev, Lea 14'35"